I present you my Jimny - Advice needed! 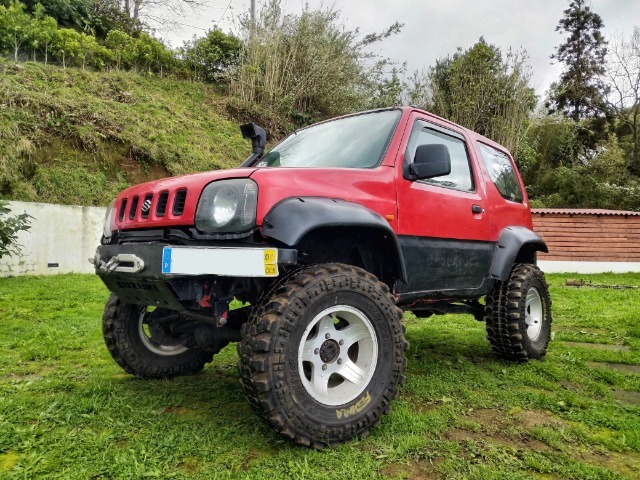 I'm Bruno, I live in Switzerland and I have just purchased a 2000 Jimny to have as my 3rd car, in my homeland, the Azores. The car was used only for competitions and it has a lift, a winch, steel bumpers, heavily trimmed arches, a snorkel, 31" 10.5 R15 tires and steering damper. I guess it may have some more modifications (gen 2 TB and caster correction radial arm bushings for example), but I haven't went through the whole car yet. Replied by Max Headroom on topic I present you my Jimny - Advice needed! Hello Bruno and a BIG(Jimny) welcome to the forums. 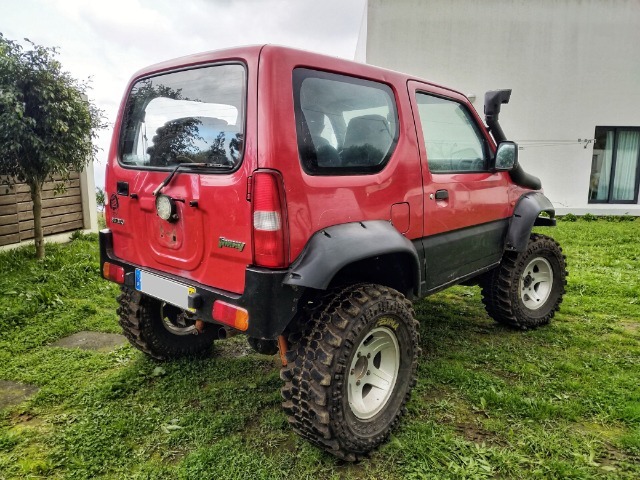 Replied by Lambert on topic I present you my Jimny - Advice needed! Welcome to the forum. 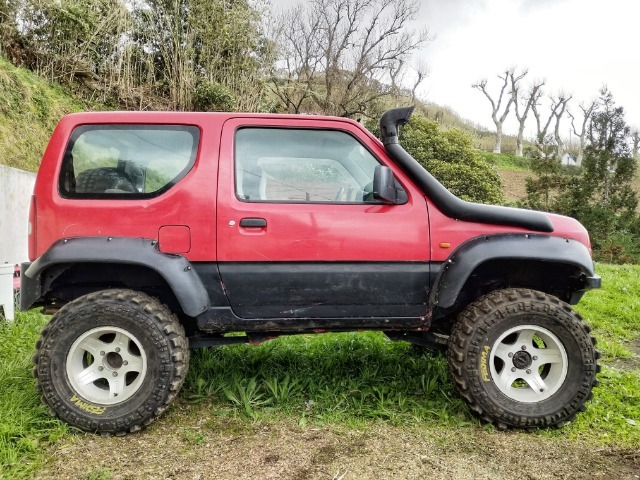 Essentially in that trim that Jimny is never going to be civilised as a road car, the centre of gravity is too high and mighty as those tyres are off roading they will be nasty on road. To tame it a little bit I would first off check that the gearing is modified to accept the size of the tyres it will be obvious if its not as it will be difficult to get moving from a start and will have no power to get up hills. Assuming that the gearing is reasonable then next I would be after a set of less ridiculous tyres like a bfg all terrain. Next I would look at putting the anti roll bars back on the front with suitable additional mounting to account for the lift. Next I would investigate the condition and suitability of the dampers to try and control the centre of gravity as much as possible. It is possible to have a Jimny that tall and still have it reasonably drivable but it's not simple or particularly cheap to get it right especially if someone else has just thrown it together in the first place as a pure off road toy. Best of luck. Last edit: 20 Jan 2019 20:43 by Lambert. 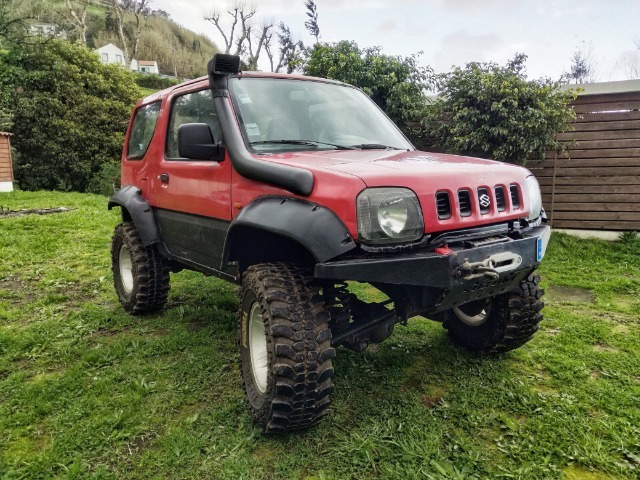 Replied by jackonlyjack on topic I present you my Jimny - Advice needed! Replied by burnazores on topic I present you my Jimny - Advice needed! I was checking with local authorities on legalizing additional tyre sizes and was informed I won't be able, at this point, to do nothing bigger than 215/70R15, 225/65R15, 205/65R16, 215/65R16 or 225/60R16. For larger diameter wheels, I will have to go through a thorough technical inspection, which is not available in the island the car is in... I will consider it later on. Given this and the available tyre choices for these sizes, I've decided to notch down the car a bit, putting in some 205/70 r15 muds. I expect the car will be pretty strange with such small tyres, so I will be dropping the suspension height a bit also. What do you guys think the current lift is? If I fit 2" springs, would the current shocks work? Any suggestions on m/t's for the sizes mentioned? additional things I should consider when making these changes? Additionally, I will inspect all bushings and steering damper and try to find a used original anti roll bar. Once again, thank you very much for you great help! Replied by Busta on topic I present you my Jimny - Advice needed! All of those tyre sizes will fit on standard suspension. 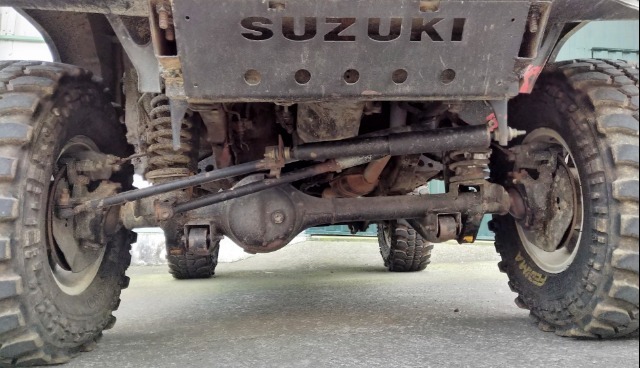 I can't tell from the pictures but if it has a body lift then any suspension lift ontop of a body lift will make it look very silly on standard size tyres. So my advice would be fit standard springs and shocks. Agreed. You could do a lot worse than putting it back to the standard suspension and a set of suitable tyres for the prevailing terrain. It might not get absolutely as far down a forest track as it could potentially like it is in the pictures but it will be much more user-friendly. I am looking at the Maxxis M8060 205/70 r15 mounted on the current rims. Do you think these would fit well in the 7" wide rims? Any suggestions on tyres (muds preferably, but some aggressive A/T could work. A 7 inch rim is plenty wide enough for a 205 bot won't be a problem. Not used the 8060 but the maxxis buckshot is a good tyre so can't see there being a problem there either. Replied by sniper on topic I present you my Jimny - Advice needed! I have KYB road springs fitted with 15mm seats. They have proved to be very good, both on road and off. They have only been in for about 5k miles but have no sign of softening despite some pretty hard off road work. After spouting their merits, they are being changed today for some Eibach pro-lift +30mm....... I have found myself doing a little more off road than I first envisaged, I want just that little more off road but I don't want to lose road manners. 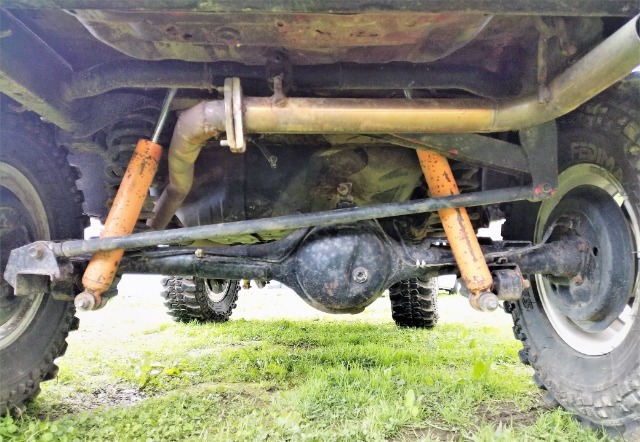 The Monroe dampers have been positively received by other forum members. Depending on the cut of your tyres, you may find the spacers need to be removed to avoid catching. Sorry just looked at your arches again..... your fine.